Announcement (July 4, 2001 Release # 01-184) from The U.S. Consumer Product Safety Commission (CPSC), CPSC is working with Underwriters Laboratories (UL) for a new safety standard for "break away" power cords for electric deep fryers. Per CPSC information, several burn injuries were related to the pulling on the power cord of the deep fryers causing the tipping over of the deep fryer. The "break away" power cord is connecting with the deep fryer with a build in magnet. It will smoothly break away from the deep fryer when the cords is accidentally pulled by someone. Thus it prevents the burn injury on human. The material to make the power cord is phenolic molding compound (PF) such as Durez152. Durez 152 black or brown phenolic molding compound can withstand the drop test, and have UL CTI = 3. Due to the fact that phenolic molding compound is cost effective (comparing with other plastic material), it has high heat deflection resistance (~190oC), high impact strength and UL94-V0 etc. Durez heat resistance grade can also be used for the making of coffee maker ring, iron insulation layer, toaster insulation parts. 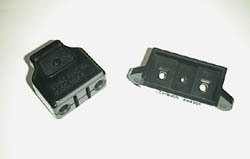 One of the good example for Durez 152 product is the break away power plug.